To order a printed copy of the Discover Gosport brochure, simply click the Request button below. 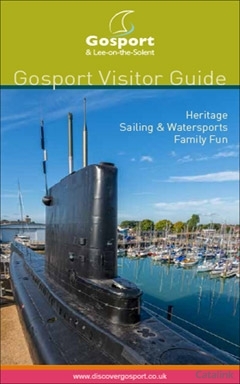 View the Discover Gosport Online Brochure Now! Located on England's south coast, just across the harbour from Portsmouth, Gosport and Lee–on–the–Solent offer an irresistible mix of fascinating places to visit and things to do for all ages. With its 24 miles of waterfront, safe panoramic beaches, impressive naval heritage, scenic countryside walks and historic trails, there's plenty to keep the family entertained. Step back in time at the fascinating Museum of Naval Firepower or the Hovercraft Museum, perfect if the English weather is playing up! The Gosport waterfront also boasts wonderful waterfront bars and restaurants to enjoy. Down on the waterfront, Gosport is emerging as a truly cosmopolitan destination attracting sailors from around the world with its deep–water marinas, a wealth of boatyards and chandlers. The town has proved to be an ideal base for both professional and recreational sailors and offers plenty of scope for watersports to suit all abilities. Add in the fantastic views of Portsmouth Harbour and across the Solent to the Isle of Wight with all kinds of ships and boats constantly sailing to and fro, and you'll find Gosport & Lee–on–the–Solent makes an ideal location for a great day out or longer stay. Request the Discover Gosport Brochure today for inspiration on the trip of your lifetime! By pressing the Request Printed Brochure button you give consent to Discover Gosport (and their Data Processors for the specific purpose of delivering your literature) to send you their Brochure .